The Arc of Alachua County had its origins with a group of parents in 1962. In 1966, the organization was incorporated as a not for profit entity and has continuously provided service to developmentally disabled children and adults in Alachua County. We are committed to providing developmentally disabled people with quality services that promote independence. 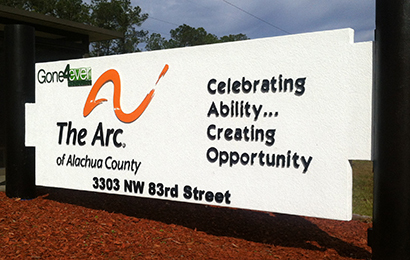 The Arc fulfills two basic functions -- The first as a direct provider of service in Alachua County to almost 300 individuals, both adults and children, covering the entire spectrum of developmental disabilities. These include: intellectual disability from all causes; spina bifida, autism, cerebral palsy, and Prader-Willi Syndrome. Services include residential settings, transitional living, supported independent living, sheltered employment, mobile work crews, supported employment, adult day training, community inclusion, and behavioral support. The Arc's other main function is to serve as an advocate for all persons with developmental disabilities regardless of where they may live or who may provide supports and services to them. Since Florida ranks 49th among the 50 states in funding for people with developmental disabilities, the need for a strong, unified voice in the political arena is crucial. In short, The Arc of Alachua County, Inc. provides an umbrella of services for the developmentally disabled. We are an affiliated chapter of The Arc of the United States, a national organization on intellectual and other developmental disabilities, and The Arc of Florida. The Arc of Alachua County is a 501(c)(3) non-profit service organization supported in part by: the United Way of Alachua County, memberships, businesses, and contributions from the general public. Our history is one of advocacy, support and service for the developmentally disabled and their families.